Recently, my team has been doing a lot of testing for our next big Windows 10 In-place Upgrade. We are designing and developing a new process that I call Windows as a Service in the Enterprise (and we plan on sharing this at MMSMOA in May). 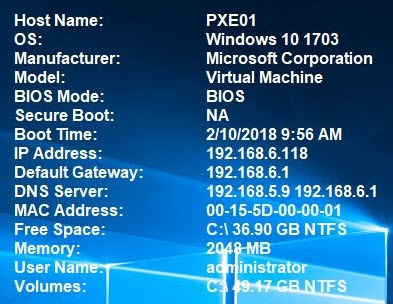 As part of our testing, we need to test both physical systems and virtual, both legacy BIOS and UEFI. Since the days seem to run together, often times I find myself wondering not only what system I am looking at, but what OS it is currently running and how it is configured. Sure this is easy to find from System Information, but typing msinfo32 gets old. Having used BGInfo in the past, I thought this would be a perfect solution to just display this information on the desktop. 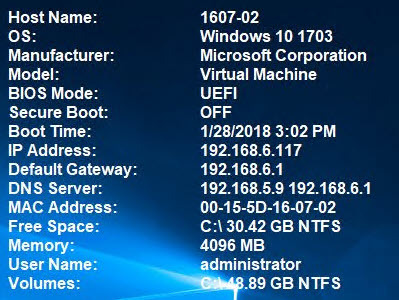 I took the time one weekend to figure out how I could use BGInfo to display the friendly version of Windows 10 – the YYMM one, not the OS build (I can barely remember my phone number these days let alone a bunch of Windows 10 build numbers – see sKatteRbrainZ‘s blog My First Day as Microsoft CEO for a funny laugh about Windows 10 versions, names and other things that don’t make sense). 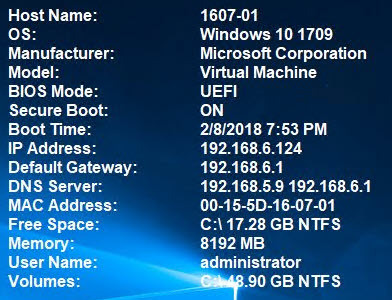 Also, being called the ‘UEFI guy’ at times, I wanted to display if a system was running legacy BIOS (bad) or UEFI (good) and if Secure Boot was On (good) or Off (bad). 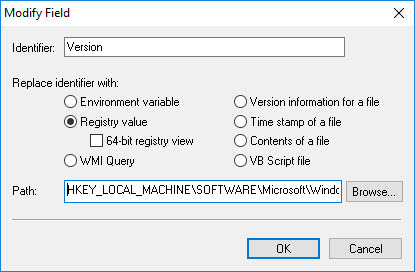 Looking at the possibilities, we see the options to select Environment variable, Registry, WMI Query, Version information for a file, Time stamp of a file, Contents of a file, or VB Script file (wait – no PowerShell option?? Quick, some tell Mark Russinovich to update this thing before Jeffrey Snover finds out). 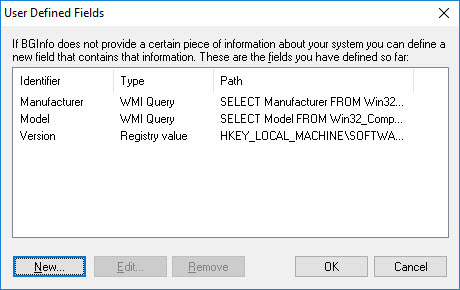 The friendly version of Windows 10 is actually easy to get since it is stored in the registry value ReleaseId under HKLM\SOFTWARE\Microsoft\Windows NT\CurrentVersion. 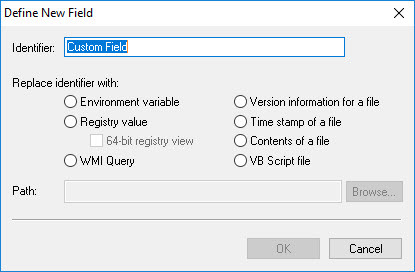 Simply add a new custom user defined field and call it Version pointing to that registry value. However, my hopes were shattered once I found out that BGInfo can only use the default namespace. So with that out and PowerShell no where to be found, I had to resort to good old VBScript. The trick was to use the Secure Boot registry key to determine both the BIOS mode and the Secure Boot state. 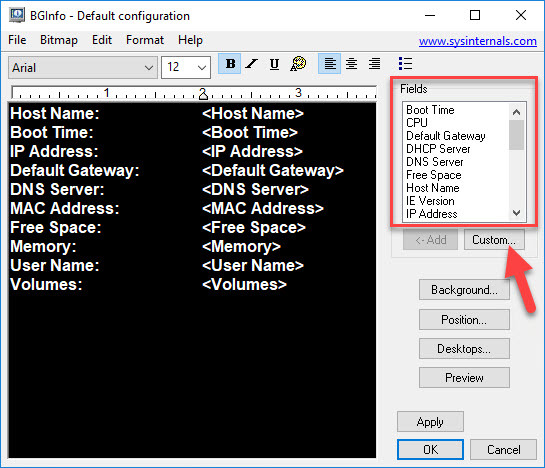 Download BGInfo file and scripts (rename to .vbs after unzipping) here. Hopefully you find this as useful as me when doing your Windows 10 In-place Upgrade testing. If you have other suggestions on fields you have added, tell me about them in the comments below. 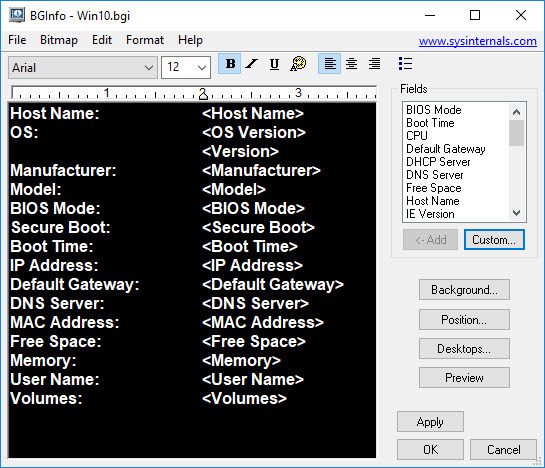 Mike Terrill’s got some very useful tweaks to the SysInternals BGInfo desktop app. Will be adapting this for work real soon now. Mike thanks for packaging this all up and wrapping it with a bow. Very much appreciated. 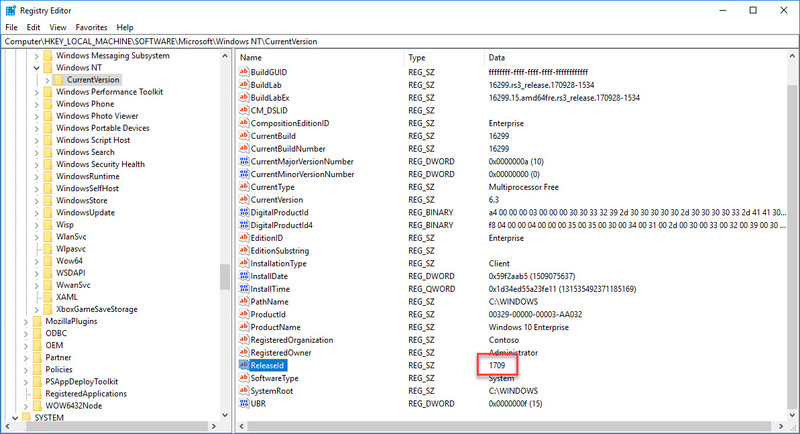 And this is in both of the .vbs files. I’m looking up anything I can about syntax on echo or type mismatches, but I cannot seem to get this to display the Secure Boot and Boot Mode on. Secure Boot displays as: (none) as does the Boot Mode. It’s happening on a 1709 and 1607 W10 ENT install. 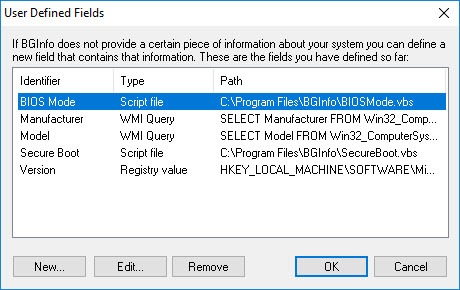 For some reason BGInfo & BGInfo64 requires you to remove the ‘wscript.’ in order for it to read the output. Don’t ask me why, that’s just how it is. For testing purposes on the command line with cscript, I put wscript.echo in the script. Once I get it working the way I like, I then remove it and use it with BGInfo(64). Mike, thanks so much for that follow-up. I will give it a whirl and see if I can get it working.